The Dividist Papers: Friday Flotsam - Back on the Blogging Beach Edition. Friday Flotsam - Back on the Blogging Beach Edition. Wherein we take a stroll down the metaphorical beach of the DWSUWF blog and note the detritus that has washed ashore and cluttered our little island of rationality in the great big blogospheric ocean. The beach is particularly messy as we have neglected it over the last few weeks. Your loyal blogger was distracted, spending time touring foreign lands and blogging about the adventures to be found on the other side of the globe. But it is an election year, the "stupid season" is upon us, and it is time to get back to work. Permit me to share a few of the shiny items we found washed up on the beach. Unsurprisingly, the first few objects we picked up look remarkably similar to items we have seen here before. First, a shout out and a quick "thank you" to Tully, who wandered over and lit a couple of signal fires to to keep the DWSUWF island from appearing deserted over the last month. We hope he will continue to visit and help me clean up this mess. ITEM - Anthropogenic Global Warming is still not settled science even if Daily Kos and the Zimbabwe Academy of Science think it is. "Indeed, the controversy has contributed to a fundamental shift in efforts to stop global warming, forcing environmentalists to scale down long-held ambitions and try to win back an increasingly skeptical American public. Walter Russell Mead of the Council on Foreign Relations, a New York-based think tank, says recent events may be causing "the death of the global warming movement as we know it." "Mann says the core argument — that the Earth is warming, humans are at least partly responsible, and disaster may await unless action is taken — remains intact. "I look at it like this: Let's say that you're in your car, you open up the owner's manual, and you discover a typo on page 225. Does that mean you stop driving the car? Of course not. Those are the kind of errors we're talking about here," Mann says. "Nothing has fundamentally changed." With all due respect to Michael Mann, cherry-picked data sets selected to conform to a pre-determined hypothesis, data massaged with "correcting " factors, ignoring the statistical level of error introduced by the correcting factors, and failing to make source data available - amounts to more than a "typo". But Mann is right about one thing: "nothing has fundamentally changed". The Mann/IPCC/East Anglica University CRU hypothesis that the world is experiencing an unprecedented period of global warming wildly at variance with recent geological history was never proven, and remains unproven today. So - indeed - nothing has fundamentally changed. None of this has prevented acolytes of AGW quasi-religious "settled science" dogma from climbing into the pulpit and instructing the flock to open the hymnbook for a sing-along. The favored hymns invariably use sloppy semantics, ad hominem labeling ("global warming deniers"), combined with appeals to questionable authority in order to dismiss AGW skeptics. A recent example at Daily Kos takes a kitchen sink approach - the point of the post apparently being that once the Zimbabwe Academy of Science and the American Academy of Pediatrics profess support for AGW - no one should question it. Sloppy semantics are found in the "poll" accompanying the post, where the flock are asked to opine on whether the climate is indeed changing and how to prioritize fixing the problem (Sample response option - "The climate is changing, but it's not a problem"). Here is the reality: The climate is indeed changing. That is a fact. We know it is a fact because the earth's climate is, has been, and always will be changing. It has been changing every second of every minute of the entire history of the planet. It always has and it always will - whether or not people were, are, or will be burning fossil fuels. Whether our fossil fuel impact is a major factor in that change. In 2001, Michael Mann, the CRU, and the IPCC asserted an extraordinary scientific claim that we are experiencing the greatest global warming in a millennium, predicted dire consequences, but failed to deliver the extraordinary evidence required to support that extraordinary claim. Instead, they offered sloppy science, a corruption of the scientific methodology, a failure to deliver reproducible evidence, a report rife with errors and filled with statistical contortions. Many of these were invoked specifically to overturn the previously accepted science showing a Medieval Warming Period that was warmer than we are experiencing today (and not needing human carbon contributions from burning fossil fuel to get there). Net net... the AGW adherents believe that the globe is warmer than it has been in a millennium. The good thing about science, is that belief does not matter. It takes time, but eventually science will out. 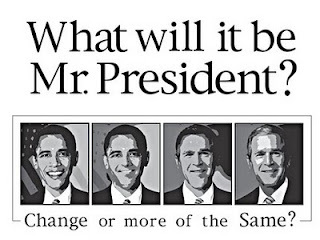 ITEM - Barack Obama is not George W. Bush, but he might as well be. "It was the most seductive argument to vote for Barack Obama - We need to elect a Democrat to "undo the damage" of the Bush administration...I expected to enjoy a couple of consolation prizes with the Obama victory. First, balance would be maintained in judicial appointments and on the Supreme Court,and second - Obama would indeed roll back some of the worst [Unitary Executive] offenses of the Bush administration. While I still have high hopes for the first consolation prize, early indications are not promising for the second. Not promising at all..."
In many ways, the Obama administration incarnation of the Bush/Cheney Unitary Executive is far worse than the Bush version. Then there was robust opposition from the left. Now, the handful of voices on the left raised in defense of civil liberties and in opposition to the continuing accretion of power to the executive branch, are lost in the noise level of the Obama apologists. They are the equivalent of "Loyal Bushies", and appear to crave nothing so much as a benevolent Obama monarchy. There were two possible paths that might have been pursued by Obama in relation to the previous administration. The Bush/Cheney executive power grab could have been seen as an outlier, an aberration inconsistent with our Constitution and reversed by Obama, restoring balance to the checks and balances between the branches. Instead the Bush/Cheney view of the unitary executive was embraced by Obama and institutionalized with the passive compliance of a lap-dog Democratic Congress. The result is that the Bush/Cheney unitary executive is now the norm, the new benchmark and will remain so for the indefinite future. At least until that new executive power is abused by this or a future executive, and Americans finally understand what they have given away. That said, this blogger continues to be surprised by the depth, breadth and frequency with which Obama=Bush meme is being flogged across the left-o-sphere. Examples include to leadership style, national security, Afghanistan, civil rights, detention without trial, Health Care, even Digital Rights Management and salmon environmental policy on the west coast. I guess it is ok for him to act like Bush, just so long as he is not Bush. ITEM - Harry Reid will change the rules of the Senate for the majority party. Good news for Harry and the Democrats, unless the Senate majority in 2011 is Republican. Senate majority leader Harry Reid has climbed aboard the anti-filibuster bandwagon, promising rule changes in the 2011 Senate to weaken the use of the filibuster for the minority party. "...the process seems to be proceeding from the premise that Senate Democrats are fed up with the filibuster. "In baseball," Reid said in a clipped tone, "they used to have the spitball. It originally was used with discretion. But then the ball got wetter and wetter and wetter. So soon, they outlawed the spitball." The same, he said, had happened to the four-corner offense in basketball. "And just the way the spitball was abused in baseball and the four-corner offense was abused in basketball," Reid said, "Republicans have abused the filibuster." Democrats will still be in the majority for the next Senate. Admittedly, the Democrats have such a large majority in the Senate that the odds remain strong they will maintain their majority. Still, there appears to be a level of hubris about the expected outcome of the midterm elections evident in the comments of Senators Reid and Schumer, that reminds this blogger of nothing so much as the Democratic Party complacency about the outcome of the special election in Massachusetts. So let's checkpoint on how the GOP Ten in Ten scenario is playing out. With Evan Bayh dropping out in Indiana the odds, while still long, got appreciably better for the Republicans to swing the nine additional seats they need. Nate Silver is projecting that the top seven senate races most likely to change parties are all Republican pickups (ND, DE, AR, IN, NV, CO, PA) . Getting two more will be difficult for the GOP as they'll need two of these five - IL, CA, WI, WA, NY - and still hold serve on all GOP seats. Unlikely, improbable, but certainly possible. It is at least as possible as a Republican winning Ted Kennedy's MA seat. "Nothing has been more disconcerting than to watch Democratic politicians and their media supporters deceive themselves into believing that the public favors the Democrats' current health-care plan. Yes, most Americans believe, as we do, that real health-care reform is needed. And yes, certain proposals in the plan are supported by the public. However, a solid majority of Americans opposes the massive health-reform plan. Four-fifths of those who oppose the plan strongly oppose it, according to Rasmussen polling this week, while only half of those who support the plan do so strongly. Many more Americans believe the legislation will worsen their health care, cost them more personally and add significantly to the national deficit. Never in our experience as pollsters can we recall such self-deluding misconstruction of survey data... the notion that once enactment is forced, the public will suddenly embrace health-care reform could not be further from the truth -- and is likely to become a rallying cry for disaffected Republicans, independents and, yes, Democrats." By passing the wildly unpopular ObamaCare bill, Pelosi and Reid may have "just enough rope" to get the job done - to the benefit of Republicans in November. A few months ago the over/under on House/Senate flips was 24/3. Today it's more like 34/5. And that doesn't count Scott Brown. Others have said it, and it looks increasingly true: The admin and the Dem leadership simply do not care if they lose their majorities in 2010 IF they can force through their health-care takeover, which they believe will be unrepealable. I cannot decide whether they really do not care or just do not believe they can lose their majorities, but tend to think the latter. "Not caring" would imply some ideological integrity, which I have hard time believing - for either party. It is practically an article of faith among the Dem faithful that they lost the congressional majority in '94 because they failed to pass Health Care Reform. I think they are still fighting the last war. No telling what they will believe if they pass this hairball and still lose the majorities.